One of the most fascinating enigmas for archaeologists in the 21st century is how ancient mankind managed to quarry, lift, and interlock megalithic blocks of stone weighing between 10 and 200 tonnes. Without the use of advanced technologies, just how did ancient cultures around the block build megalithic sites such as Puma Punku, Teotihuacan, Sacsayhuaman, Ollantaytambo, and Baalbek? Is it possible that they had in their possession now lost, advanced technology that we are unaware of? Engineers, architects, and even archaeologists remain fascinated by ancient man’s achievements. One of the most impressive ancient sites on the planet is Baalbek. Located in modern-day Lebanon, in Roman times this ancient complex was known as Heliopolis, or the city of the sun. The giant blocks of stone found here are one of archaeology’s greatest enigmas. The true age of this sacred site remains a profound mystery for scholars. Mainstream archaeologists have mixed feeling about the site and its age. Most researchers believeBaalbek was a Phoenician sanctuary dedicated to the God Baal, even though most people would agree that the site was built by the Romans. The truth, however, is that no one can accurately say how old it is. Many believe that Baalbek goes back tens of thousands of years, even possibly some 20,000 years, making it one of the oldest sites on the planet. But the age and history of Baalbek aren’t the only impressive features. The megalithic blocks of stone found at the site have caused admiration, amazement, and controversy, not only in the archaeological community but general population as well. The temple in honor of Jupiter stands on a platform that has defied explanation. The Trilithon is where all mainstream explanations are shattered. Three colossal blocks measuring 22 meters in length, nearly 5 meters in height with a width of 3.5 meters are one of the biggest enigmas.Their weight ranges between one and two thousand tons. Just how did ancient people manage to quarry, transport, lift and place these megalithic blocks of stones thousands of years ago, without the use of modern technology? The three blocks are positioned onto a row of six granite blocks, which measure 10 meters in length and 4 meters in height, their weight is estimated to be over 300 tons. Today, modern engineers would have a hard time transporting a 50 ton block. However, ancient people seemed to have had a way to transport blocks of stone of incredible size with ease. The entire ancient complex of Baableb was constructed with HUGE megalithic blocks that range in weight from 1,00 and 1,500 tons each. 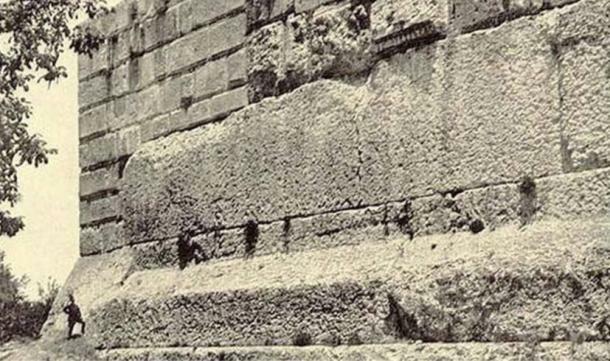 How is it possible that ancient people managed to transport this huge blocks of stone and then place them in position so that they fit perfectly with each other. Mainstream archaeology has no clue! Better yet, the precision found at Baalbek is fascinating, resembling other ancient sites in South America. The precision of the megaliths is breathtaking; they were arranged in such a way that you cannot fit a single sheet of paper in-between them. But interestingly, like many other ancient sites found around the globe like Puma Punku,Ollantaytambo, Teotihuacan, etc… the construction of the megalithic site at Baalbek had a drastic stop in its construction phase. 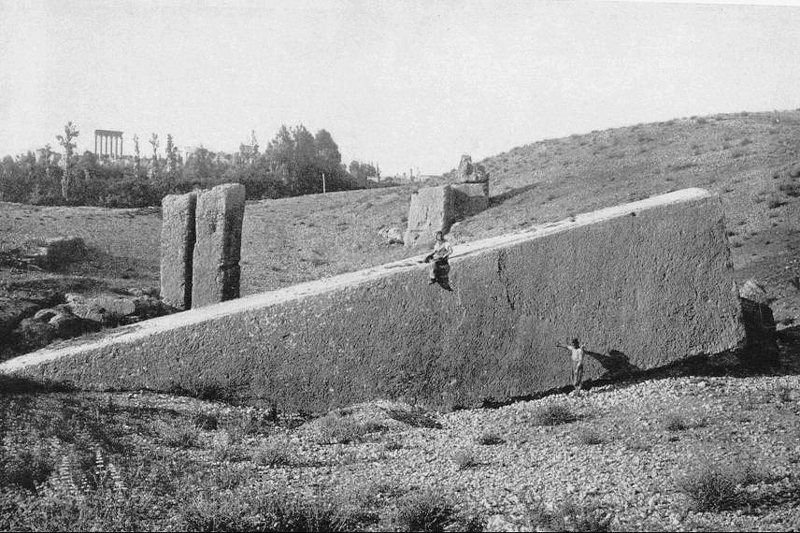 Surprisingly, in the vicinity, researchers discovered another huge block of stone partially buried with staggering dimensions: 19.6 meters (64 feet) in length, 6 meters (19.6 feet) in width, and about 5.5 meters (18 feet) in height. Researchers estimate that the weight of this huge stone block is around 1,650 tons which would place it as the largest known stone block quarried from antiquity. But why did ancient builders halt its construction? 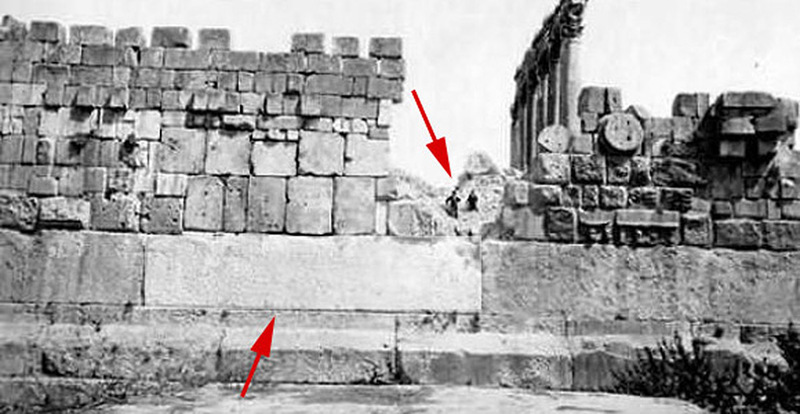 This is why one of the biggest questions about Baalbek remains the biggest mystery: How did the ancients do it? 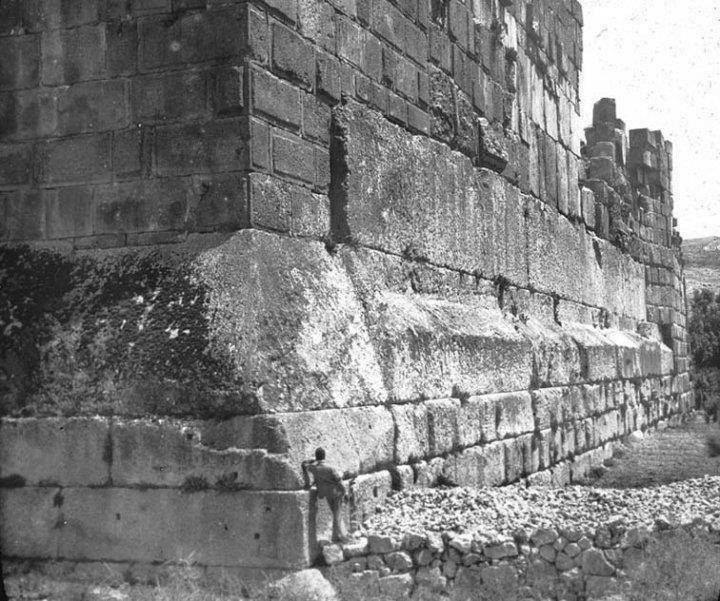 Heliopolis at Baalbek – The upper stone re-constructions were done by the Romans, but the lower 1000 ton stone bricks forming the original foundation… nobody knows. (a ton is 2000lbs). Previous Article← Large Hadron Collider Created A Portal To Another Dimension?